Today we did a one-way hike from the Flying Mountain parking lot to the Acadia Mountain trail head on route 102. Cameron and I drove one car to the parking area on route 102 and then drove over to meet up with Janice and Emma with the other car at Flying Mountain. This is one way to do a one-way hike (ha ha). In the summer we sometimes take a car with bikes and leave either the car or the bikes at the ending destination. Another summer option, depending on the hike, is to leave a car somewhere on the Islander Shuttle route, then ride the shuttle to a trail head and hike back to the car. It’s a good thing that we hiked this trail one-way because it was treacherous. There was about 4″ of fresh snow on top of solid ice which greatly reduced the effectiveness of our trail crampons. Every step (and slip and fall) was a challenge and we were grateful not to have to hike back the way we came. We just piled into the car that Cameron and I had left, drove back to Flying Mountain to pick up the other car, and then made the short trek home (1.8 miles) from there. Despite the difficulty and danger of this hike, the scenery and views made it worth it. 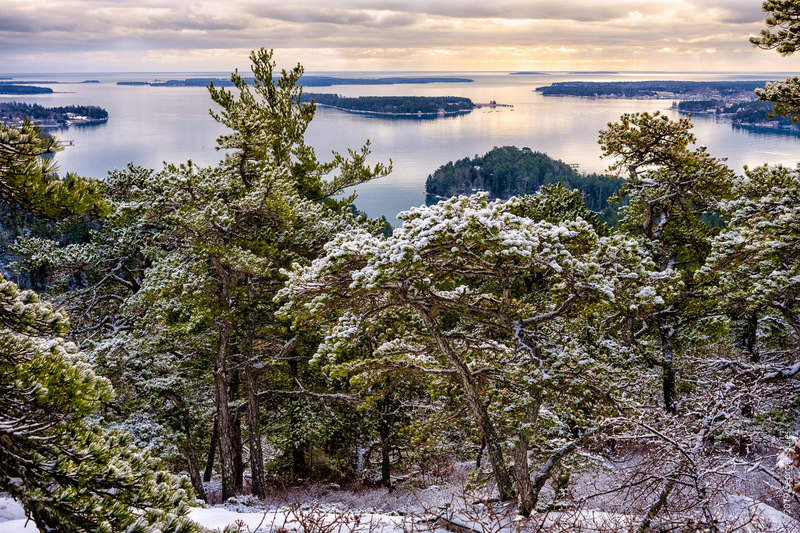 Acadia National Park and Mount Desert Island are magnificent in winter. Click on the two images below to see for yourself. I shot both with a Fuji XT-3 and a Fujifilm 27mm f/2.8 pancake lens. This camera/lens combination is small enough to fit in my jacket pocket and thus is my go-to kit for hiking. 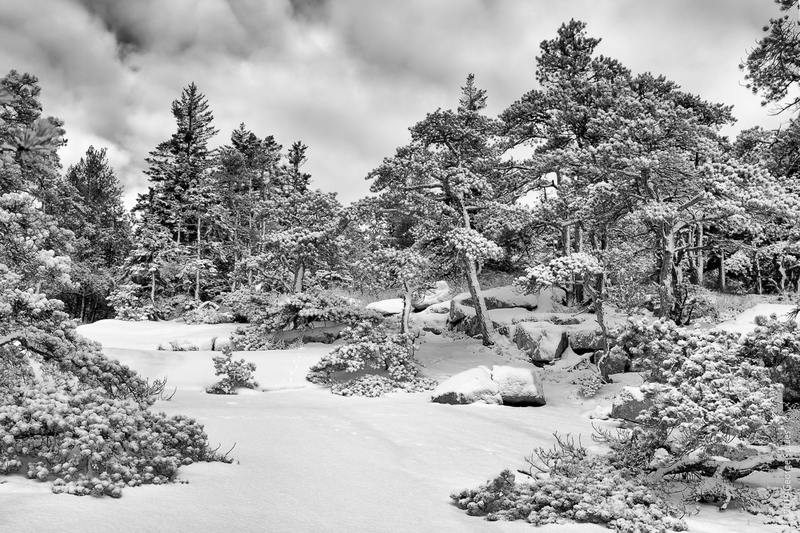 The black and white photo is a three-shot pano with each shot taken vertically hand-held. I stitched them together using Lightroom. To learn more about Saint Sauveur, set this post from 2013.